A Precautionary Tale shares the inspiring story of a group of citizens in Mals, the tiny town in Northern Italy which became the first place on Earth to ban pesticides by a referendum vote. Their colourful, courageous and ultimately savvy campaign is being heralded around the world as a landmark effort in the fight for toxic-free food and agriculture systems – and a model for other locales, near and far. It wasn’t the first time that Mals had come under siege. Situated at the intersection of three countries and two historic passes over the Alps, the small town of 5,300 inhabitants had a long history of being caught in the middle of various turf battles waged by warring tribes, bishops, counts, emperors, and even nations. But this newest turf battle was a little more literal – it was about hayfields. This invasion wasn’t anything like the last war, which had taken the lives of a number of Malsers. This time it was completely different. In the valley below them, the pounding of mortars was replaced by the pounding of concrete posts, and barbed wire was traded for trellis wire. Laser beams were cutting through farm fields along established coordinates, providing the precision needed to commandeer the terrain and turn hay- and grain fields into fruit factories. The incursion itself was no secret. It was years in the making; the people of Mals had watched the gradual march of the orchards up the slopes, directly toward them, with a few infiltrators already ensconced in the town’s network of villages. But the biggest threats were hidden in the enveloping mists blasted from the spray machines mounted on the back of the advancing tractors. Even after the tractors passed and the mists dissipated, the stench would linger in the air, permeating a landscape with more than five thousand years of documented agricultural traditions in this high Alpine valley. It was all up for grabs. Big Apple was rolling into town. And it seemed like nobody was going to stop it. You would be hard-pressed to find a better measure of contrasts in Mals than mayor Uli Veith and dairy farmer Günther Wallnöfer. Günther will show up to almost any function in a T-shirt, work pants, and heavy leather farm boots, while Uli will appear looking fresh and dapper in his perfectly tailored suit. Günther’s handshake will feel like he’s about to squeeze milk out of your four fingers while Uli’s firm but uncallused squeeze is a testament to his habit of making acquaintances from all walks of life. Günther will insist that he can speak only Tirolean dialect and high German while Uli will shift fluently between both before jumping in with English or Italian. But they always shared one thing in common: a deep passion for what they both dubbed a sustainable future for Mals. Before long, they would both add another descriptor to the future they envisioned for their town – healthy. Dairy farmers don’t tend to embrace politicians or meetings very readily, but as far as he could tell, Günther had limited options for people who would comprehend the full scope of the dilemma, much less have the means to help address the looming issues. When he met with Uli, he described the problem as succinctly as he could, framing it as not just his issue but a quandary facing all of the 5,300 citizens in the eleven villages of the Mals township. With the small field sizes that dominated the Mals landscape – usually just a few acres – and the renowned Vinschgerwind, the legendary wind of the valley blowing for days or weeks at a time, the drifting of pesticides applied by any single farmer onto other farmers’ fields was inevitable. In addition, with the town’s waterways, bike paths, playgrounds, and schoolyards in such close proximity to fields that might be converted to intensive fruit production, the health of the people and the environment was in peril. Mals was going green but the future was looking gray, at best. With organic farms, traditional grain growing, bike touring, agritourism, herbal products, and even the region’s first organic hotel all in the works and on the rise, an influx of pesticide-dependent fruit “plantations” could mean the collapse of so many collective dreams. Günther was adamant: Farmers should be able to manage their farms the way they wanted to, but only up to the point at which their decisions negatively impacted others. If the situation he faced was just the beginning, which certainly seemed to be the case, then any hope of Mals being the last regional bastion of sustainable and diversified agriculture seemed doomed. Uli concurred and agreed to help find a solution. Neither quite realized what they were agreeing to. They were about to challenge the way things were done not just in the orchards and vineyards of the South Tirol but also in the ballot box. Stirring things up is a messy business. 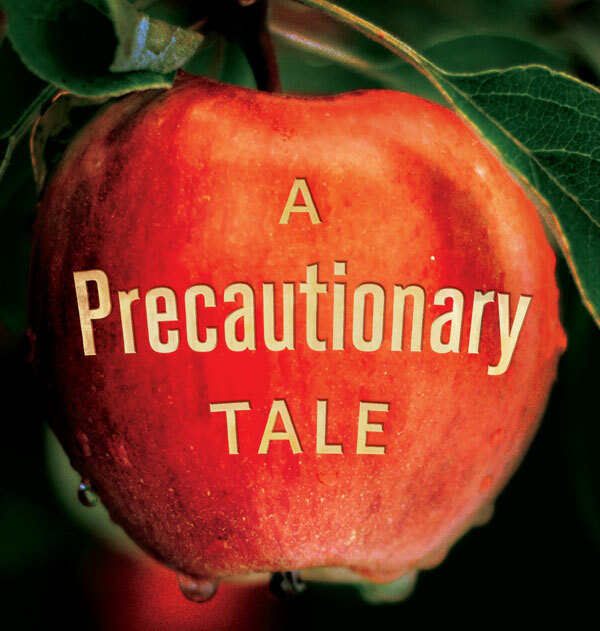 A precautionary Tale: How One Small Town Banned Pesticides, Preserved Its Food Heritage, And Inspired a Movement by Philip Ackerman-Leist (Chelsea Green Publishing, £11.99) is available now.